The ski resorts of La Mongie and Barèges are linked by their ski area to create Le Grand Tourmalet which is the largest area in the Pyrenees. There is over 100 km of pistes in the 11km between the two resorts with a range of runs to suit all abilities. La Mongie is described as a freeriders paradise and is all about the snow, whereas Barèges is a charming Pyrenean village. Properties are ideally located at the foot of the slopes for fast and easy access for first lifts. 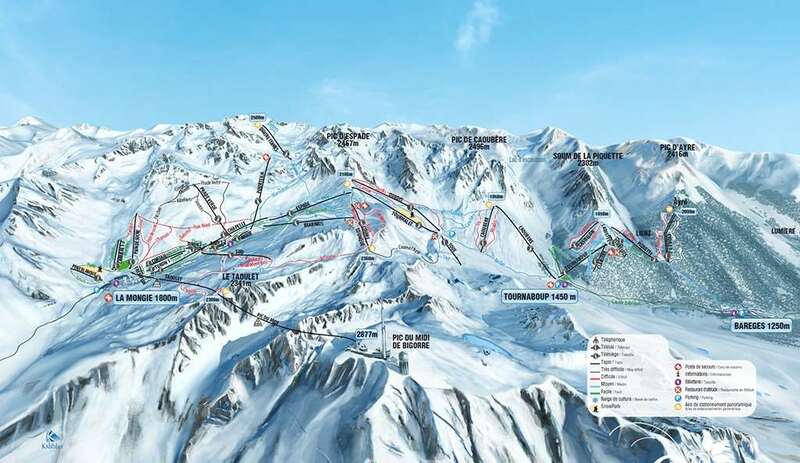 The 69 pistes in Le Grand Tourmalet are made up of 17 green runs, 24 blue runs, 21 red runs and 7 black runs which give all levels of skier or snowboarder plenty of choice during their week in the mountains. The large open bowl ski area gives plenty of off-piste choice for experience skiers. There are a decent selection of bars, restaurants and shops in La Mongie with a range of activities to enjoy in the evenings such as skidooing, tobogganing, snowshoeing and sledding. Top bars include Le Schuss and L’Igloo. 30 minutes are in Barèges you can experience one of the best spas around, Aquensis. There is a naturally heated pool complete with fun features and a wellness area. Transfer from Lourdes Airport to La Mongie is really quick, it’s about 1 hour and 15 mins transfer by coach.